This year, my brother and I threw a Mother’s Day celebration for our closest Moms. My mom, Jane, my brother’s wife Tham, my mom in law, and my Ba Co. I roasted two 6-lb Catfishes, and my brother bought presents for each mom and watched them play Mother’s Day White Elephant after we ate. It was a very nice relaxing Mother’s Day and now the mom’s are going to expect this every year. 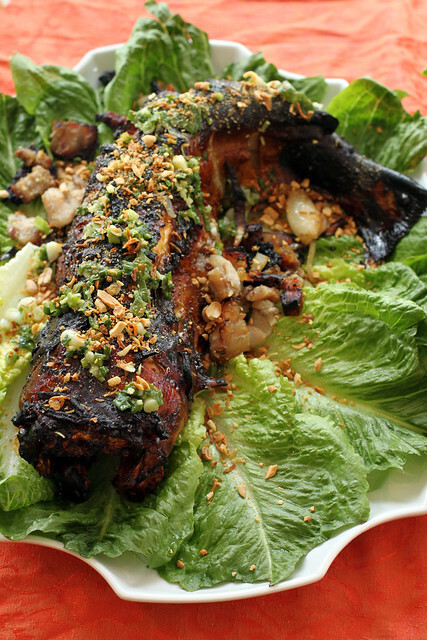 Vietnamese Roasted Catfish is awesome! It has been on the top of my list of recipes to try. My first encounter with this was at Asia Garden in San Jose. It was one of the best fish I’ve ever eaten. The skin was super crispy and flavorful and meat was very flaky and delicious. Unfortunately, Asian Garden closed down and I can’t find another place that prepared this the way I tasted it at Asian Garden. 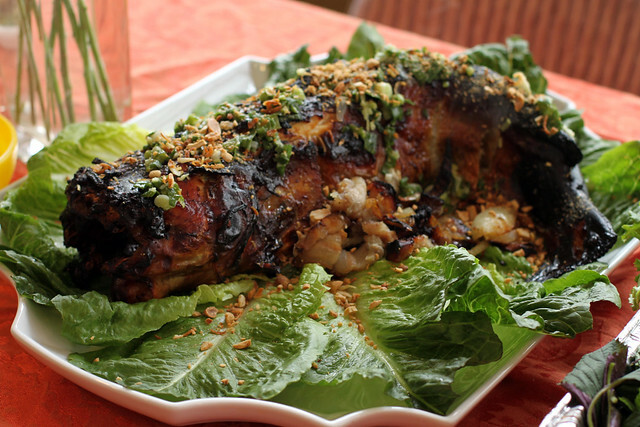 I came across this Vietnamese Roasted Catfish recipe on the Ravenous Couple blog site a couple months ago and waited for the perfect occasion to make it. I picked out the Catfish at Lion Market and asked the butcher to clean the Catfish so I didn’t have to do it at home. He scrubbed the heck out of the catfish. Cleaning seems like a very tedious process. This is awesome because when I came home, the fish was ready for marinade. 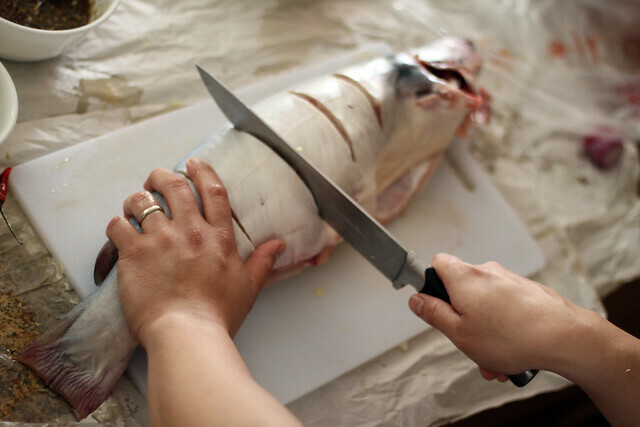 Using a sharp knife, make a few vertical cuts to the side of the catfish. 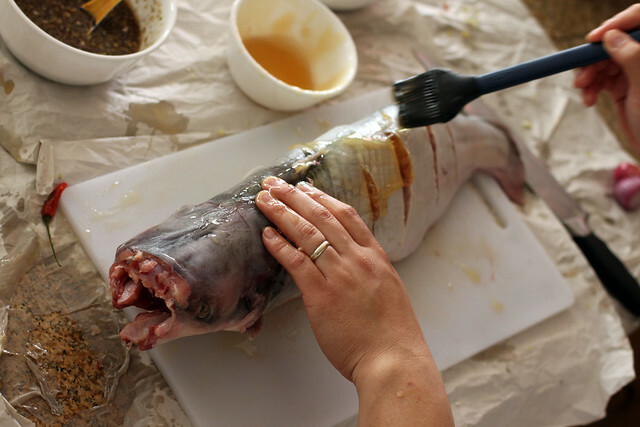 Lather the catfish inside and out with a generous amount of honey. Using a mortar and a pestle and pound garlic, ginger, Thai chilies and green onions into a paste. In a bowl, combine paste, lemon grass, fish sauce, 4 tablespoons of honey, and pepper. Marinade the whole catfish with the mixture. Let rest for at least 1-2 hours in the fridge. Slice pork belly into bite sized pieces and stuff inside the catfish. Roast in the oven for about an hour. 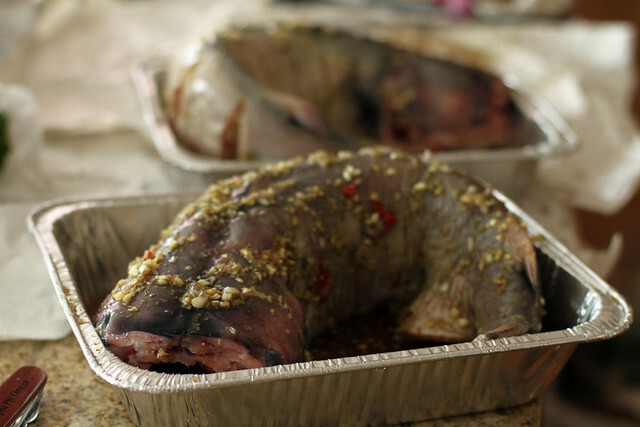 If you notice that only one side is browning, rotate the catfish so the other side can get some love also. When the fish looks just about done, take the pork belly stuffed inside the catfish outside and broil the fish and pork belly for a few minutes for extra crispy skin. In a small saucepan, combine ingredients for scallion oil and simmer for a few minutes. Start the Roated Catfish Springroll party!